A paradise for all pizza lovers! 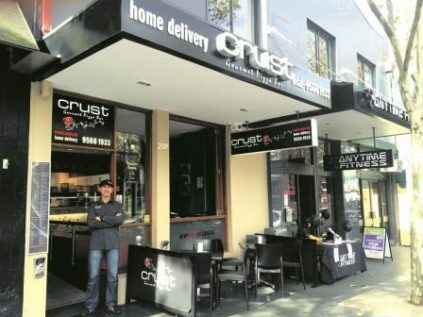 Crust offers an incredible selection of toppings and pride themselves on sourcing fresh ingredients locally. The pizzas are made by hand with careful attention to detail, so that the right amount each topping is used in the best combination to ensure optimum flavour experience. They have all the classic styles plus taste adventures like Vietnamese Chilli Chicken, Peking Duck, Truffle Beef Rossini, Peri Peri Chicken and Szechuan Chilli Prawn. If you’d like to try your hand at designing a taste sensation, you can choose your own toppings. Make sure you finish off with a delicious Belgian waffle. You can sit in for a casual, relaxed meal, get take-away or stay in your pyjamas and have them deliver to your door. Crust pizzas are an easy crowd-pleaser and a perfect catering solution. Great pizza from the base up.